Volume 26 of The Hacker Digest consists of articles published in 2600 Magazine from 2009 to 2010 on nearly 100 subjects of interest to hackers and those who want to understand what hacking is all about. In addition, there are two complete works of "hacker fiction," along with regular columns on telephony and the computer and communications industry. There are also four Hacker Perspective columns from some of the most well known hackers, describing their experiences, thoughts, and philosophies on the subject of hackers and their place in society. Finally, the book is rounded out with one of the most popular features: the letters to the editor (200 in this edition), often with biting retorts from the 2600 staff. 5つ星のうち5.0Finally, a large print edition! For those of us with vision problems, we've always wanted a large print version of 2600. I've always scanned the entire issue and used my Nintendo DS and a flashcart to read the issue (or used a magnifying lens, which is a pain). Now we finally have a version that is not only more portable, but the font can be resized too. Other benefits include taking notes that you can go back and search later, favorites, and all the normal Kindle features we like. As a secondary note, I wish that the Kindle would have an option to where the "screensaver" (OK, a "don't show the text of your e-book" screen) can be set to use the book/magazine's cover instead (or even a random or pre-selected picture within the file). I hope back issues are made available too. 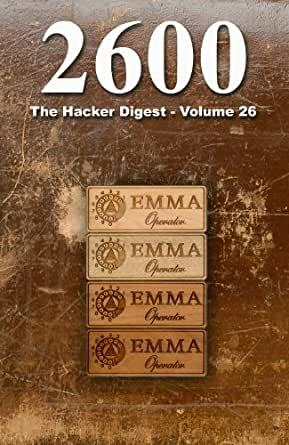 I enjoy reading 2600 magazine and its digests. I am not a hacker per se, but I do enjoy learning what I can. There is some stuff I don't bother reading, and some that is over my head. Yet I tend to read 2600 from cover to cover lest I should miss anything of interest.